I have a range of tools in my writer’s toolkit, items that inevitably accompany me when I set off on a writing jaunt. But first, let me be clear about something. 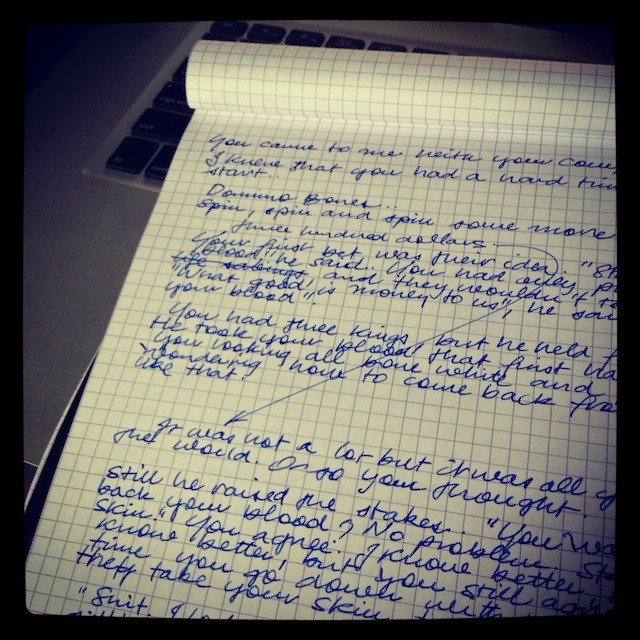 I know that the writing’s the real point - and that fetishism of objects and ‘kit’ is a red herring, to use that time-worn literary cliché - but I can’t help finding the paraphernalia of writing inspirational, and an integral part of the craft. Collecting and using lovely things is certainly part of the fun. Firstly, let’s look at the digital tools. The weapon of choice is my 11-inch MacBook Air, a recent acquisition that I now could not be without. Excellent for posing as a hipster, as well as powerful, fast, practical and light as a feather. For a while I tried writing on a P-series Sony Vaio that I own; it is tiny, and great to carry, but I am a Mac user primarily and the keyboard didn’t really cut it; nor did battery life or the (lack of) usefulness of Windows software. So I’m back in the Mac fold, and I wouldn’t go anywhere with my Mac without also taking my wireless hotspot, a little mouse-like device that allows me to connect to the internet while I am out and about. 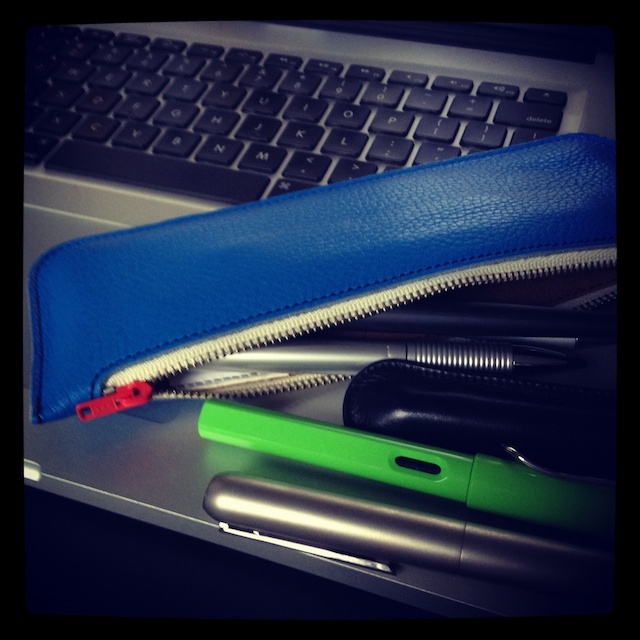 While the contents vary from time to time, I keep my analog tools in a bright blue vinyl Pinoccio pencil case by MMMG, otherwise known as Millimetre/Milligram, who make lovely stationery bits and pieces. This is a photo of the Pinoccio here. It really is an aesthetic delight, and such a brilliant blue. And because it is new and I am still in love with it, the Faber Castell E-Motion Fountain Pen I mention in this earlier post. Having a range of writing implements allows me to pick my tool according to my mood. I also just like having such lovely things on hand so I can make ready use of them - these objects were made to be used after all. Finally, there is the writing pad of choice. For the feel and performance of the paper, particularly with fountain pens or the Uniball Eyes, I can’t go past the Rhodia pad by French paper outfit Clairefontaine. It might be more romantic to use a Moleskine in some people’s estimation, but I find them to be a little restrictive, and I feel more ‘precious’ about them for some reason, which is counterproductive. Rhodia pads are well made, write smoothly and they seem more ‘generic’ than Moleskines, and I mean that in a good way. Less precious. The paper really is gorgeous, and I find that this matters when using better pens. Rhodia pads also come in a huge range of sizes and styles including A4 flip pads. I tend to favour the grid layout rather than the ruled or plain - perhaps it is my architectural training, but I like the look of handwriting more on the gridded pages. You can also use them sideways if the mood takes you. You can find Rhodia pads, Pinoccio pencil cases and lots of my other kit at what is easily my favourite online stationery store, Notemaker.com.au. (In fact I can’t visit that site without buying something - I think I am paying the rent on their warehouse!) I got some of the pens mentioned above, including the Pico, the E-Motion and the Porsche, at Pen City on Elizabeth Street, another favourite haunt. What’s in your kit? Share with the group.